JUDE - Book 2: The Surface Yellow. If Jude had needed to express to his shrink the one word that jumped to his mind as he purveyed the scene all around them, it would undoubtedly have been: Yellow. Of course, nuance was possible if the psychiatrist loosened up the rules a bit: Jude could define and determine yellow beige, brownish yellow, plain yellowish, brightish yellow, blinding yellow, beigish yellow, harsh yellow, sandy yellow of course ... Sunny yellow, definitely-not-organic yellow - and, had Jude had plentiful time and equal quantities of life-credits to remunerate the shrink, he probably could have continued describing this yellowness until the shuttle came home, so put out and aggressed by it as he was. However, there was another word that wanted to interrupt and argue for supremacy, and that one was: Stones. Subdivided into: stony, rocks, rockishness, boulders, lots of stones, definitely-not-organic stones. And after these two distinct race-leaders, yellow and stones, came a respectable mumble-jumble of words such as: flat, big, blinding, hot, ugly, unwelcoming, definitely-not-organic ... "Well, surprise, surprise," piped Leeman, "we're breathing!" A quarter of the way up the sky, the sun dazzled. Terrifying, giant and hot, Jude wanted to ignore it, to pretend it wasn't there, arrogant and threatening and sheelaping hot. He preferred solar-simulators. But yes, they were breathing - and quite without effort. That was the first surprise. The air was strange for sure, it didn't smell of sweet pine or baked bread but neither did it burn instant holes in the trachea ... "Callcut's epic saga is a fabulous collage, an immense opera, a journey, an initiation. 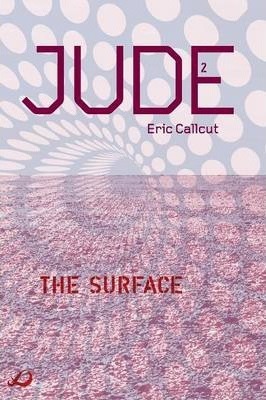 Eagle-sharp, witty, and cruel ..." "The Surface" is the second volume in the JUDE trilogy. "We are in need of great adventures that lift us up and carry us away ... "